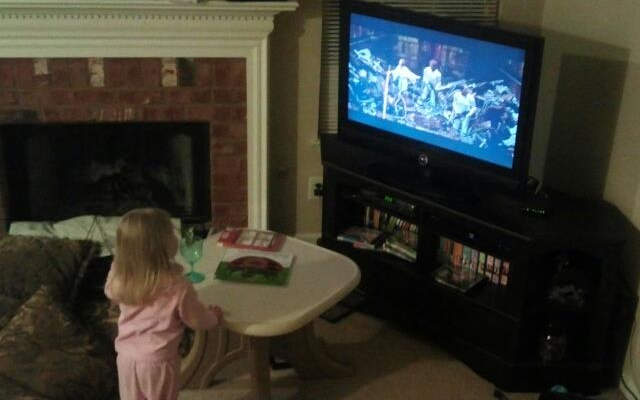 upon watching A New Hope for the first time, her first Star Wars film. When my daughter Anne was born, I was a bit of a lapsed Star Wars fan. As a kid in Junior High and High School I dove into the new (and not just to me) Expanded Universe. I devoured the Zahn trilogy novels as they were released, bought the monthly issues of the early Dark Horse Comics as I found out about them (I started monthlies with Tales of the Jedi: Dark Lords of the Sith and Dark Empire II), and fully embraced the Shadows of the Empire multimedia project. I saw all the Special Editions in the theatre, slowly downloaded the Episode I teaser trailer, stood in line for Phantom Menace tickets, did midnight madness for action figures, went to the very first showing in my hometown, actually did enjoy the movie, and then I went off to college, where my interest in Star Wars media in general somewhat, well, went away. Now, to be clear, Star Wars hadn’t done anything to offend me. I didn’t rage-quit the fandom. I didn’t hate George Lucas or accuse him of doing dark things to my childhood. My notice and interest just went firmly into the periphery. I didn’t hate Attack of the Clones or Revenge of the Sith at all, I didn’t feel like they did any sort of violence to childhood memories like some appeared to have believed, but, well, they were to me, just Movies That Happened, and movies that I saw, and enjoyed as I enjoyed many of the other movies I’d seen. When The Clone Wars animated film came out, I noted its existence, but circumstances didn’t permit me to get to a theater to see it. I didn’t have cable at the time, and didn’t have the strong need to begin watching the series as it aired on Cartoon Network when it came on. It was, again, a thing that existed, and that was cool in theory, but not a Priority. » Read more.. If you asked me if I write fanfic, I’d answer quickly and swiftly that I don’t. Except when I took a moment to actually think about what that means, I realized that this isn’t entirely true. I don’t write fanfic in the traditional prose sense, but I love writing up bullet points of speculative connecting tissues and frameworks, what-if scenarios, Sandboxes and Structures that would be great fun for others to play around in. » Read more..